Rosacea and Adult Acne: Is there a Difference? Rosacea is a common skin ailment characterized by redness, small bumps and pustules concentrated on the nose, cheeks and forehead, and telangiectasia, or dilated small blood vessels near the skin’s surface. Approximately 14 million adults between the ages of 30 and 60 suffer from rosacea, although many falsely believe they’re dealing with another even more common skin issue: acne. If you’re not sure whether your irritating and potentially painful redness and bumps are caused by acne or rosacea, here are the easily recognized differences, and a few home remedies available to treat both. Although it’s not completely clear, scientists believe rosacea is caused by a variety of environmental and lifestyle “triggers.” These triggers can be as simple as irritation or sun damage. More complicated immune responses or reactions to psychological issues, including stress can also be the culprit. Whatever the cause, it’s important to note that rosacea isn’t dangerous and it isn’t contagious. Another issue related to rosacea that baffles scientists is the role heredity plays in your chances of suffering from the condition. There’s no evidence that rosacea is hereditary, although according to a survey conducted by the National Rosacea Society, nearly 40 percent of respondents noted a family member also suffered from the signs and symptoms of the condition. The Differences Between Acne and Rosacea? Did the symptoms first appear during your teenage years or after 30? 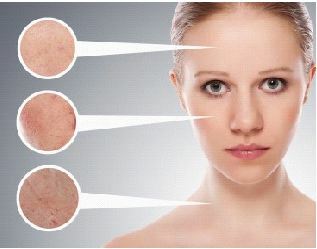 Typically, acne sufferers begin noticing redness and pimples during their teenage years. Most individuals with Rosacea don’t suffer any symptoms until age 30 or later. Does your condition affect the eyes? Rosacea can often cause redness or irritation of the eyes. This is a rare with acne. Do you suffer from redness and bumps on your chest, back or neck? If the answer is “Yes,” the issue is acne. Rosacea only occurs on the nose, checks, chin or forehead. Do you have blackheads and whiteheads? If you answered “Yes,” but you also suffer from redness, irritation and swelling, you could suffer from acne and Rosacea. Wash your face with a cleanser containing no dyes or perfumes. Wear a scarf over your face to prevent irritation caused by exposure to cold or wind. Stop wearing makeup. If you choose to wear makeup, purchase products labeled “non-comedogenic,” which means they don’t clog pores. Use facial products that are free of alcohol or other ingredients that can irritate or dry the skin. Wear sunscreen every day. Choose a product that’s labeled “hypoallergenic” and features an SPF, or sun-protection factor, of at least 40. Wash your face twice daily with a homemade product formulated for your skin type. For instance, if you suffer from oily skin, create a simple cleanser with lemon juice, oatmeal and yogurt. For dry skin, substitute tea tree oil for lemon juice. If you have sensitive skin, a simple combination of oatmeal and yogurt is enough to keep your face looking smooth and acne-free. After washing your face, remove any excess oils, dirt and bacteria with witch hazel or tea tree oil. Both products are inexpensive, natural, safe and available at health and beauty or craft stores. Apply a homemade acne mask at least once-a-week. No matter what your skin type, a combination of one tablespoon honey, one egg yolk, one tablespoon lemon juice and one-quarter cup oatmeal is a great way to eliminate the excess oils, bacteria and dirt that lead to unwanted acne. No matter if you suffer from Rosacea, acne or both, there are many natural and prescription remedies available. However, you’ll never know how to treat or prevent either condition unless you know what you’re dealing with. To truly understand Rosacea, it’s best to seek a professional diagnosis from a trained doctor or dermatologist. About the Author: Simon Franks is a blogger and spa owner. Simon suffers from adult acne and has learned to control the condition by identifying and avoiding his flare-up triggers. Click on “more information” to learn about other acne remedies.